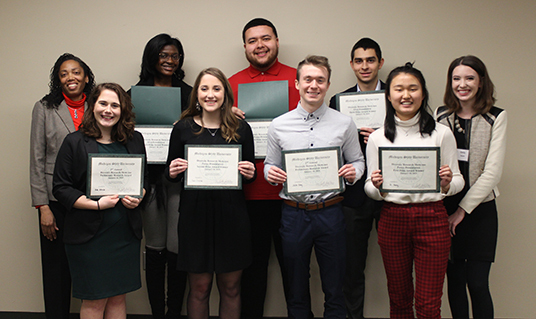 The 2nd Annual Diversity Research Showcase was held at the MSU Union on Friday, January 18 and featured oral and poster presentations from Michigan State University undergraduate students. The Diversity Research Showcase provided students with the space to present their work or work in progress on issues of diversity that advance inclusion with peers, faculty and staff. This opportunity was made possible by sponsorship from the Honors College, Undergraduate Research Office and Office for Inclusion and Intercultural Initiatives. Qi Huang for “Barriers to Advancement in Organizations for Women and Asian Americans.” Huang is an Honors College senior majoring in psychology in the College of Social Science. Huang’s faculty mentor is Professor Ann Marie Ryan in the Department of Psychology. Sadie Shattuck for “The Housing and Neighborhood Quality of Low-Income Homeowners: Do Perceptions Match Reality?” Shattuck is a senior majoring in arts and humanities in the Residential College in the Arts and Humanities and social work in the College of Social Science. Shattuck’s faculty mentor is Professor Anna Maria Santiago in the School of Social Work. Victor Alberto Ruiz-Divas for “Educational Segregation: How Racially Restrictive Covenants and Redlining are Still Impacting Students in Urban Public Schools.” Ruiz-Divas is a senior majoring in history on the College of Social Science. Ruiz-Divas’ mentor is Chance W. Lewis. Triniti Watson for “An Inquiry Towards MSU’s MRULE-ICA Program.” Watson is a junior majoring in interdisciplinary humanities in the College of Arts & Letters. Watson’s faculty mentor is Assistant Professor Adan Quan in the Department of Anthropology. Emily Saxon for “Comparing Sexual Misconduct Prevention Strategies Among AAU Schools.” Saxon is an Honors College sophomore majoring in psychology in the College of Social Science. Saxon’s faculty mentor is Associate Professor Michael Stamm in the Department of History. Eliot Haddad for “Funding Exclusivity in the Sciences.” Haddad is an Honors College freshman majoring in human biology in Lyman Briggs College. Haddad’s mentor Marisa Brandt in Lyman Briggs College. Justin Duby for “Do Diversity Resources Make an Organization More Favorable? An Investigation of Identity Cues in Recruitment.” Duby is a sophomore majoring in psychology in the College of Social Science. Duby’s faculty mentor is Professor Ann Marie Ryan in the Department of Psychology. Olivia Orlando for “Hospitality Business Students’ Perception on Women in the Workplace.” Orlando is a senior majoring in hospitality business in the Eli Broad College of Business. Orlando’s faculty mentor is Assistant Professor Mi Ran Kim in the School of Hospitality Business.